When we planned to travel to Alaska in hopes of seeing bears and kayaking within glaciers and heli dog sled. However, these were all summer activities (bears are in hibernation). Originally, we were pretty bummed because those were a few of the activities we wanted to do but since we were traveling during winter it was time to come up with a different game plan. 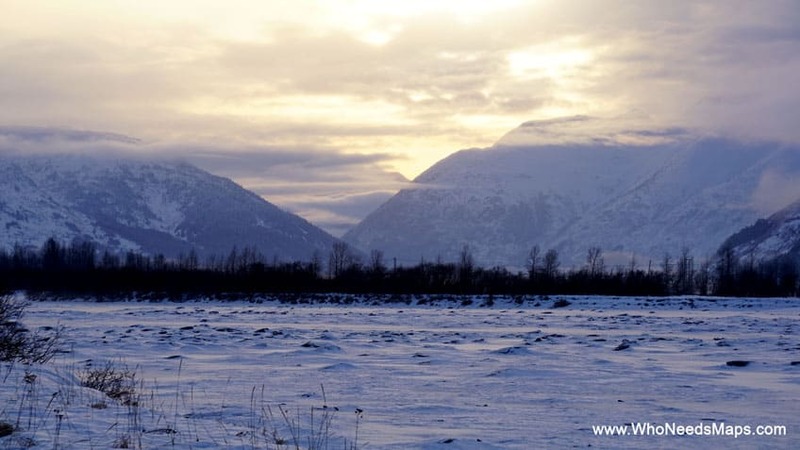 We have never traveled to anywhere like Alaska especially during a snowy winter like that. So we wanted to find the coolest and prettiest winter activities and we did. 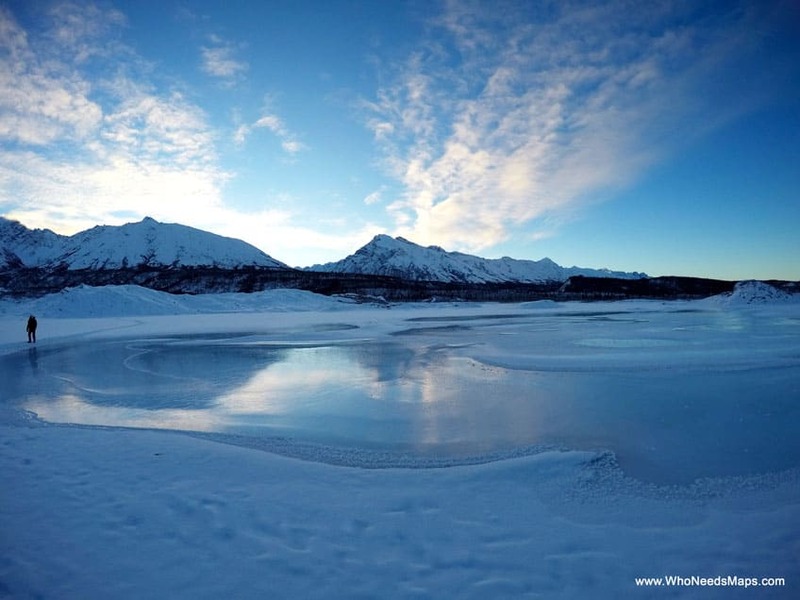 To say the least, Alaska in winter is one of the most stunning places we have ever seen and there is so much to see and do. 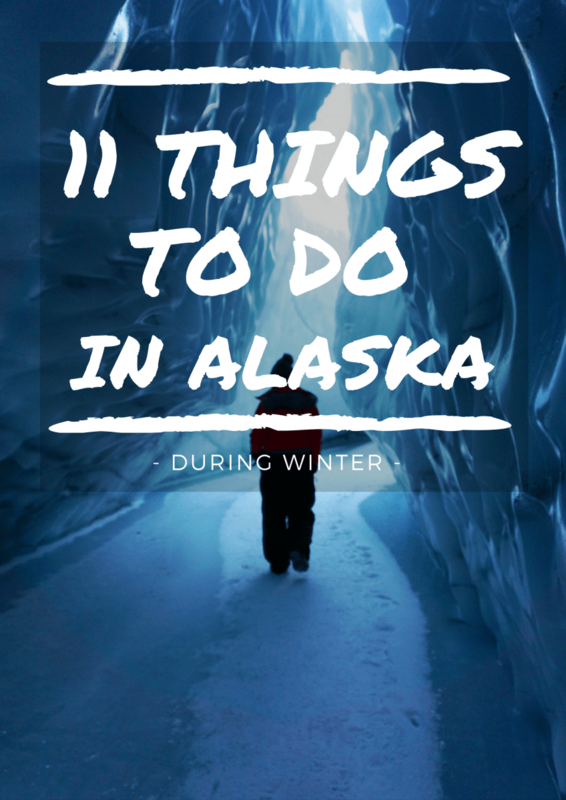 Here are the top 11 things to do in Alaska during winter. 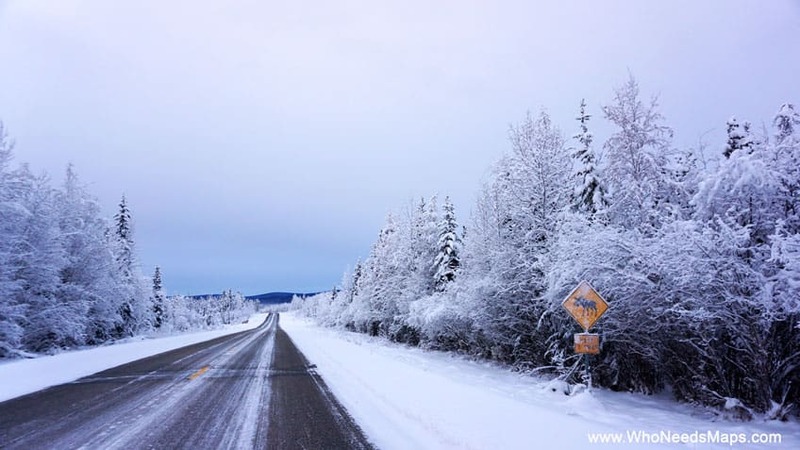 **We decided to travel to Fairbanks and Anchorage so our recommendations are based on that (but there are so many other great cities to visit). 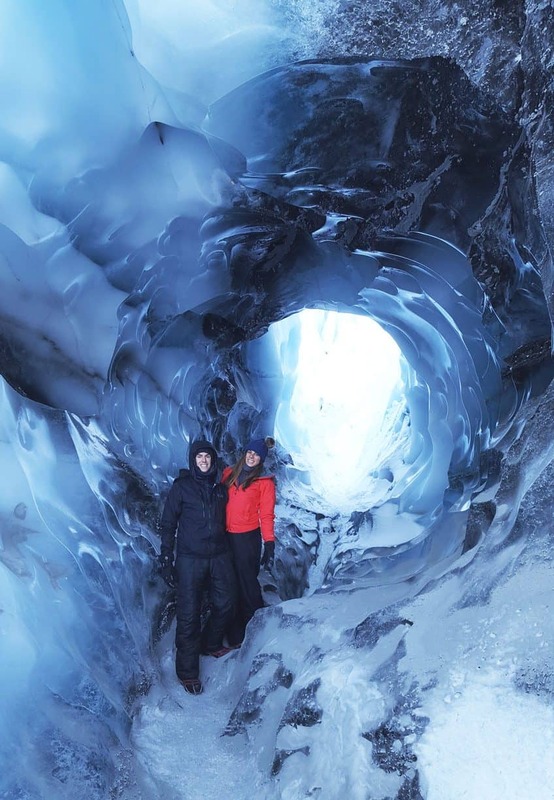 We trekked the Matanuska Glacier, a thousand-year-old frozen 27-mile long river of ice, with Salmon Berry Tours. This was one of the coolest (no pun intended) places we have EVER seen. 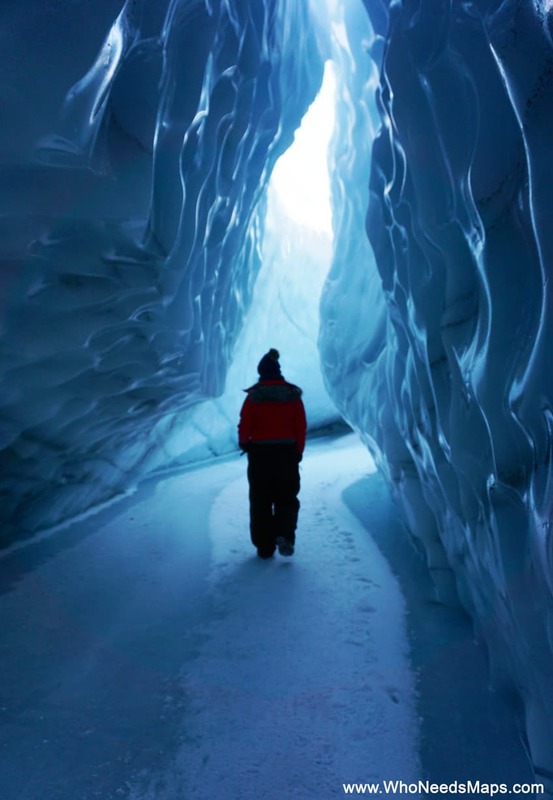 The glacier is filled with ice formations, frozen lakes, and stunning ice caves. Salmon Berry provided us with Crampons for our shoes, hand warmers, snow pants, a delicious lunch and a really great fun and knowledgeable guide (Derrek). We highly recommend going with Salmon Berry Tours, this was a day we will always remember. It was worth every penny. 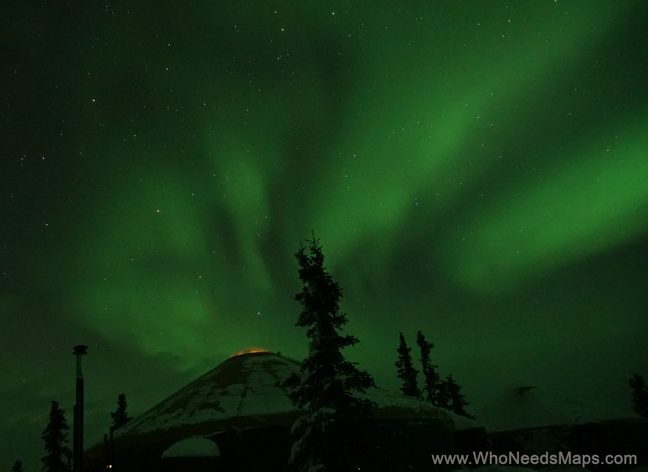 One of the main reasons we traveled to Alaska during winter was to see the stunning Northern Lights. We were very excited to have spent our night hunting in Anchorage with Jody from Alaska Photo Treks (which was so fun and WARM!). It’s great to take a tour to see the lights as Jodi had a warm van, she took the time to teach us how to photograph the lights properly, and above all, had delicious snacks and hot cocoa. Here is one of our favorite pictures Jody took on the trip! (Thanks for the awesome memories and pictures, Jody!). 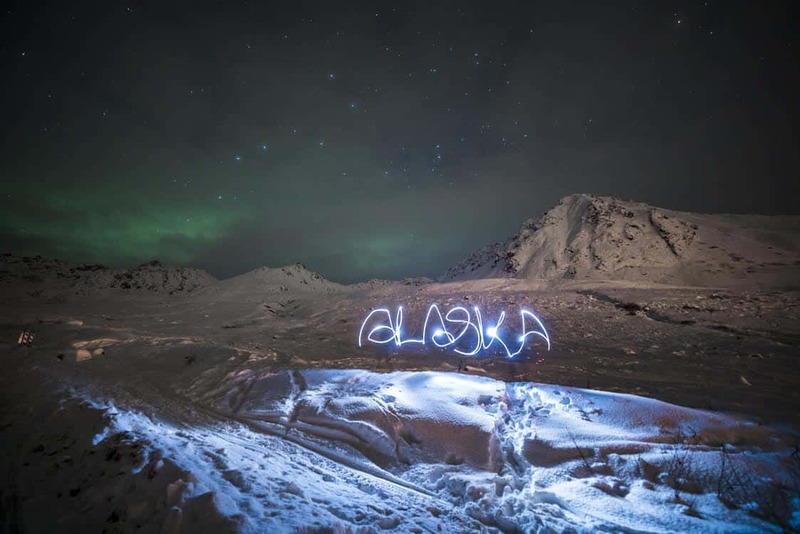 Alaska Photo Treks (aka the wonderful Jody) will help you get great photos, take great photos of you and find the most perfect spot to find these lights. 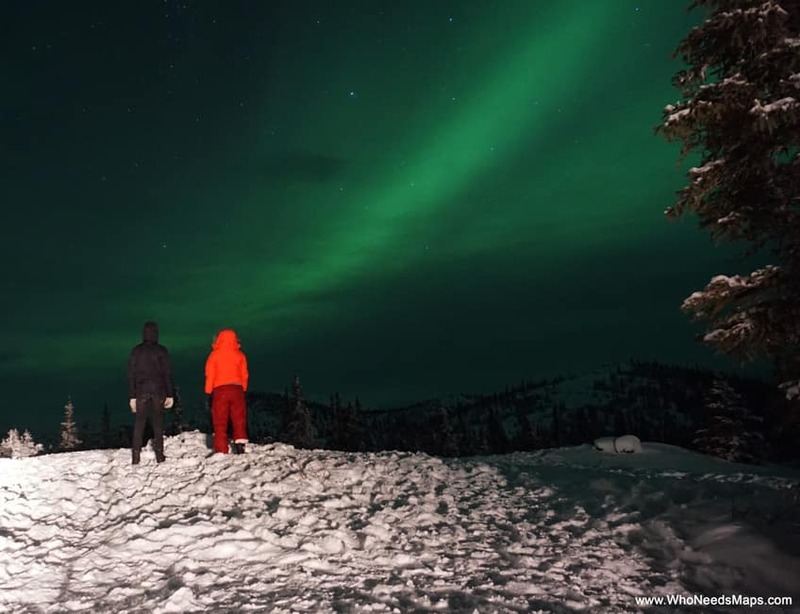 The Aurora Borealis is a spectacular natural phenomenon in Alaska that is worth waiting for. When you see the bright colors dancing in the sky, you will be in awe. 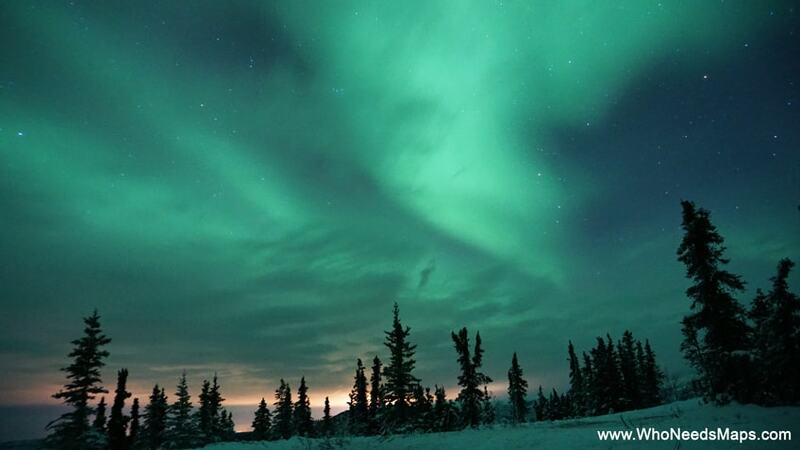 It left us breathless, and the thrill of the hunt for the lights in Alaska is exhilarating! Be patient, dress warm, and be ready to possibly cry. You can check the Aurora forecast here. 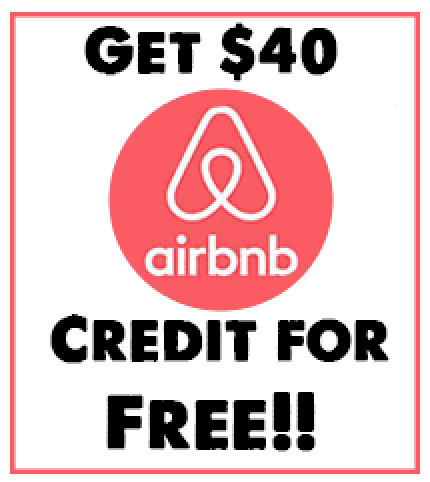 ***Since the lights aren’t guaranteed (because it’s nature), always book more than 1 day on a tour. I LOVE DOGS! This is something I have always wanted to do but always kinda felt bad about it? Does that make sense? I just didn’t know if the dogs were treated well out in the cold and all that. And you know what? These dogs absolutely LOVED it!!! 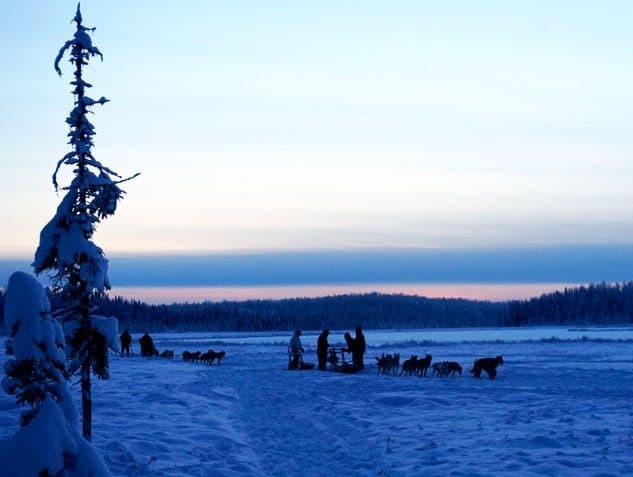 When the mushers came around, the dogs all went wild to have a turn mushing. It was the most adorable thing I have ever seen. If you are traveling to Alaska, this is definitely one of the most memorable experiences we did! We loved to see how happy the dogs were, the fact they all got massages, and to give these dogs well deserve cuddles and pats. I would love nothing more to play with all these dogs all day long! 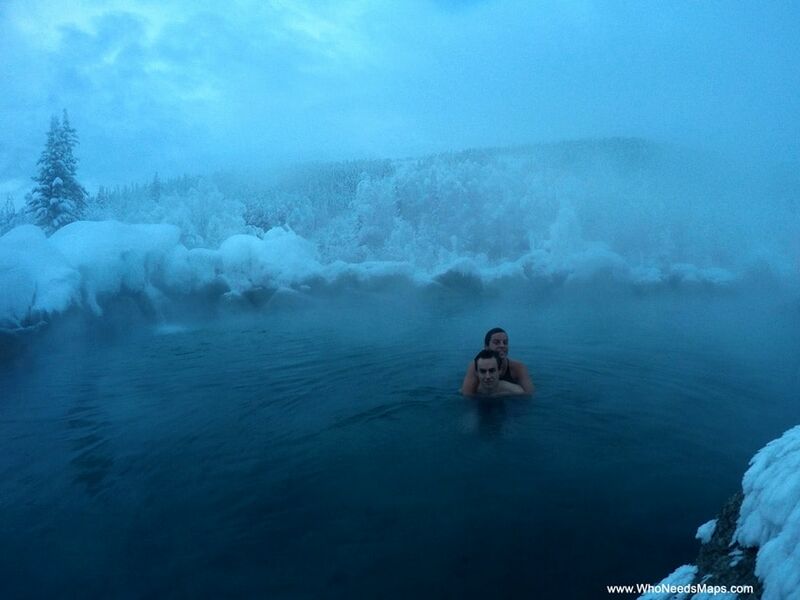 Chena Hotsprings Resort is about 60 north from Fairbanks. It is a beautiful drive up to the resort, but the resort itself is out of this world. 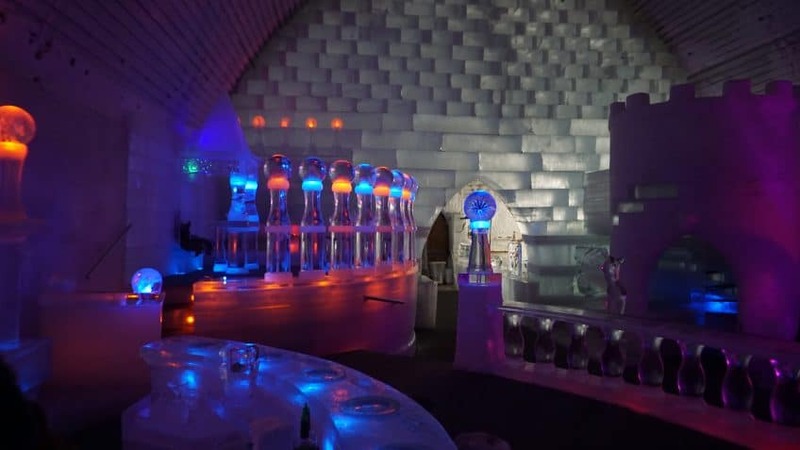 They offer so many amazing activities like the hotsprings, dog sledding, snow mobiling, an ice museum (with a glass made of ice apple martini! ), and Northern Lights Viewing. The resort is mostly known for their hot springs. While we were there, it was about -15F out and 115F in the water and the temperature contrast was something we never experienced before. It was so cool!!! 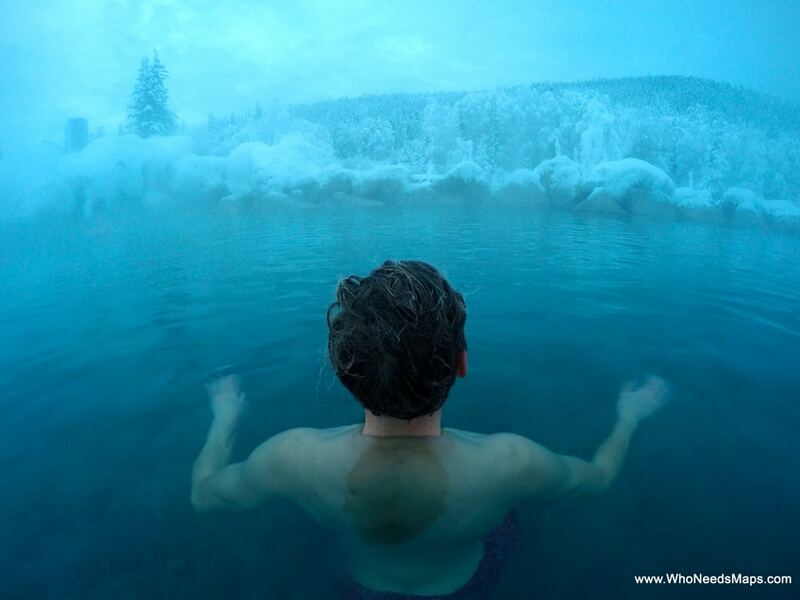 You are surrounded by all the snowy trees and mounds of fluffy white snow and then all the steam from the hot water. It was so cold, it even froze our hair!!! We went twice, once at night and once in the morning (morning was more fun so you can see the actual snow and steam). We only went for two days and one night, but there are so many cool things you can do there. 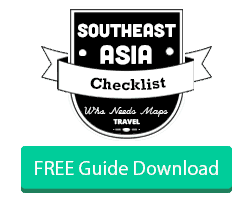 It is worth the road trip up there! 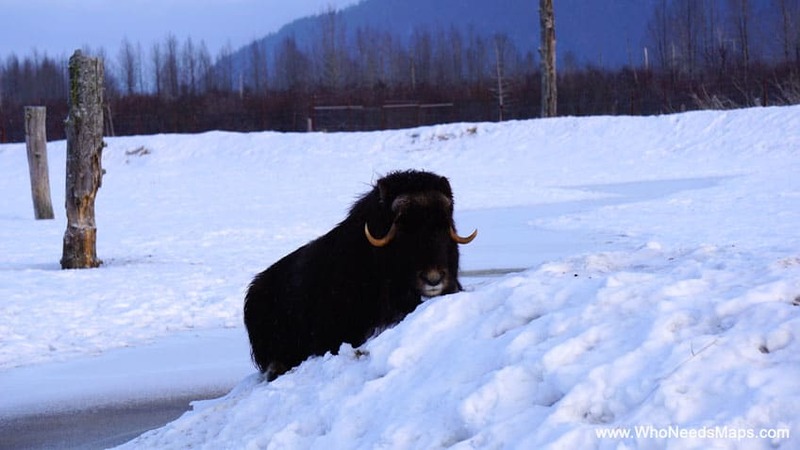 Alaska has some incredible wildlife that roams the streets, but you can’t guarantee those encounters so the conservation center is a great way to see them. 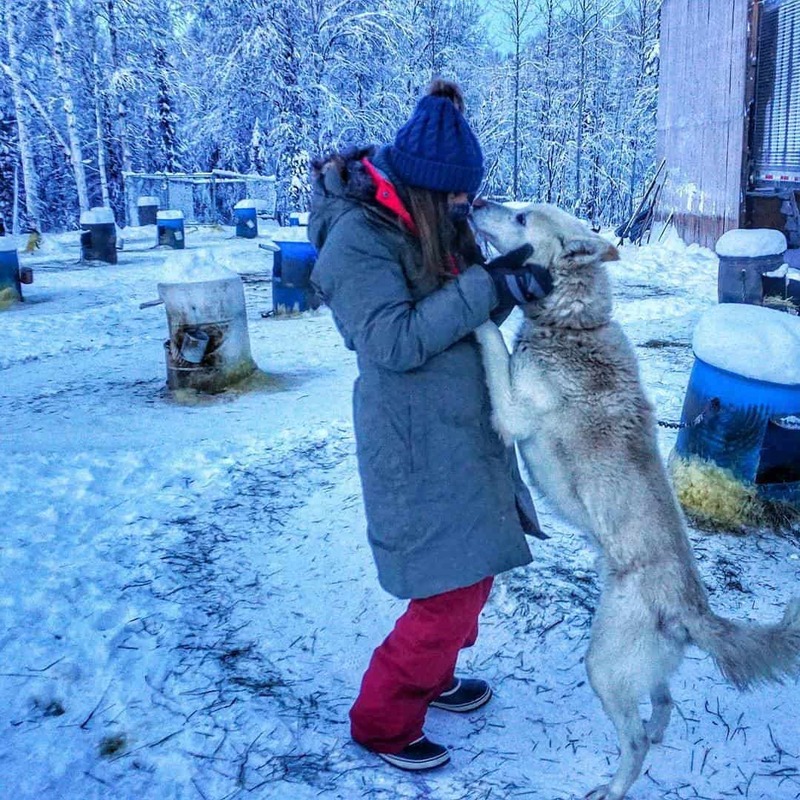 The Wildlife Conservation Center is a nonprofit organization dedicated to preserving Alaska’s wildlife through public education. 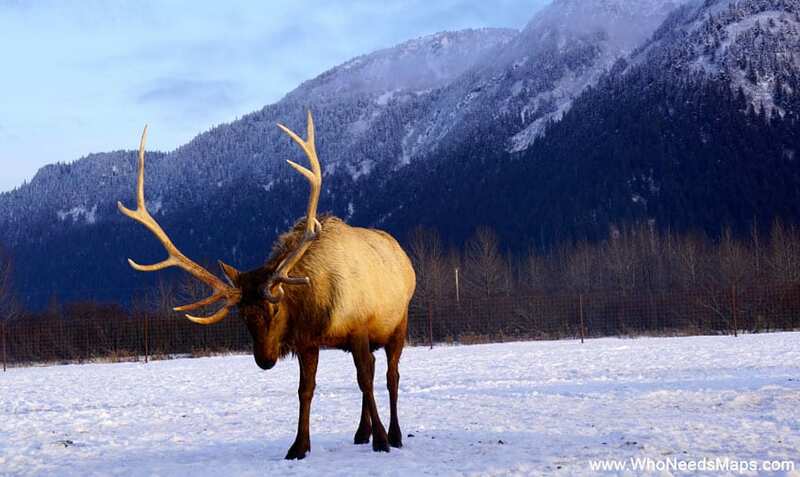 See animals like moose, bison, caribou, lynx, and many othersIf you love animals, this place is definitely a must. We actually didn’t have a chance to go ice fishing due to time, but we really wanted to! We love the idea of catching your own dinner. Alaska is known for their fish like Rainbow Trout and Arctic Char, so you will most likely catch something delicious. Depending on the time and place, Alaska might require a fishing license which you can get here. We can’t tell you how much we love to road trip; apart from walking, it’s one of our most favorite ways to see the beauty of where we are traveling. 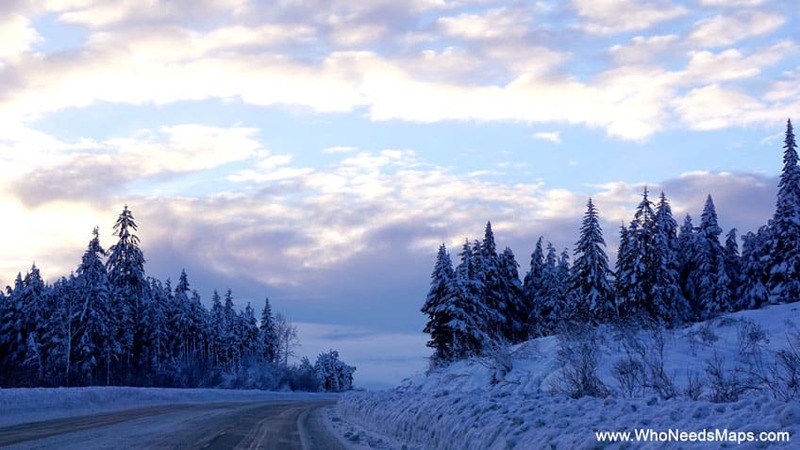 Alaska is like a beautiful winter wonderland, so renting a car and driving around offered some spectacular views. If it is your first time driving in snow, make sure you get an all wheel drive. You will also have to plug your car in 30 min before (or have the engine run for a bit before driving). Drive slow and pump break and you should be sweet. To be totally honest, we never thought skiing/night skiing was a big thing in Alaska but someone recommended it to us and we had to absolutely do it! 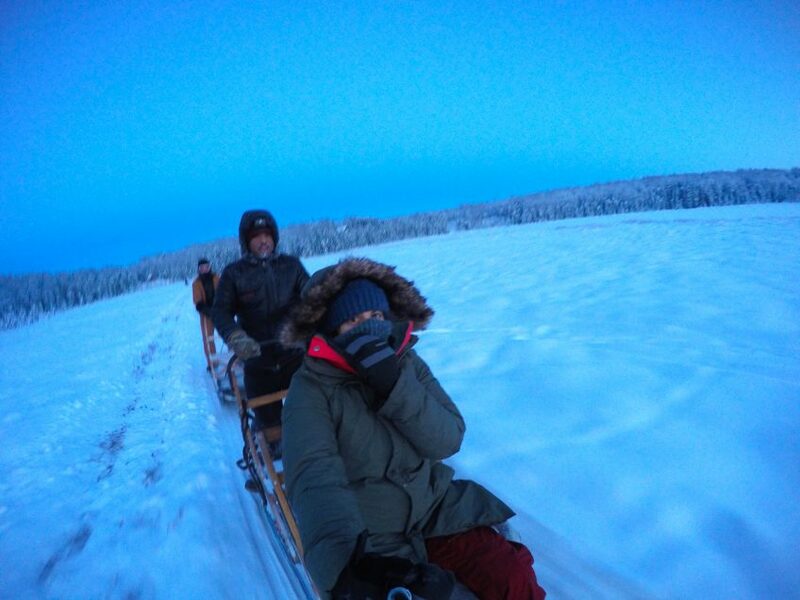 We love to try skiing/snowboarding in new places, but we both have never night skiied so we thought this would be a very cool adventure. Plus, it was very reasonably priced in comparison to places near LA. The city and mountains look really beautiful in the night. Alyeska Resort is only a bit of a drive from Anchorage. It is also a really beautiful drive too!!! Just get ready for the cold, the wind chill going down the mountain will freeze you so be prepared and dress warmly. Make sure your head, eyes, nose, neck and fingers are covered and you should be able to have an excellent day out in the snow! Since we went during the holidays, a lot of places were closed, but it’s ok, we know how to make the most of it! There were a few indoor and outdoors skating rinks that rented out ice skates for $3 a pair in Fairbanks which was really nice. It can be tough to get your ice legs, but after a few minutes, you will be gliding on the ice like the snow prince(cess) you are! Also available, are hockey stick rentals. Alaskans loved the ice hockey. 10. 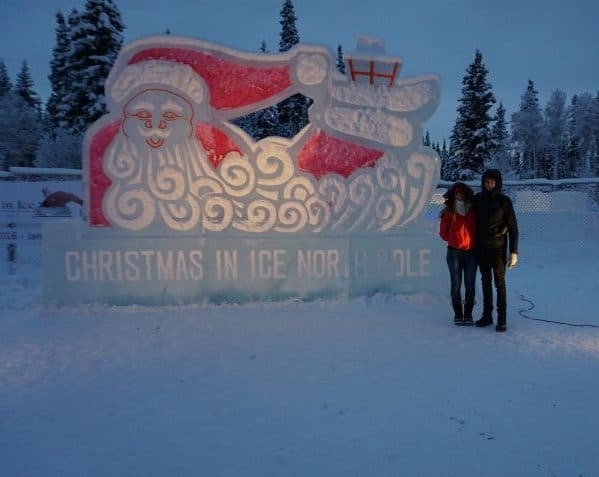 Visit the North Pole! Guys, the North Pole is real!! 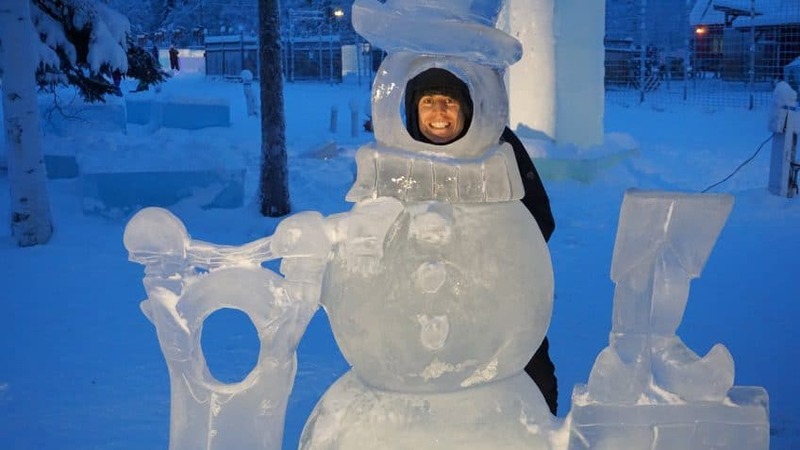 There is a city a few miles of Fairbanks named the North Pole, and you know what it’s home to? SANTAS HOUSE! 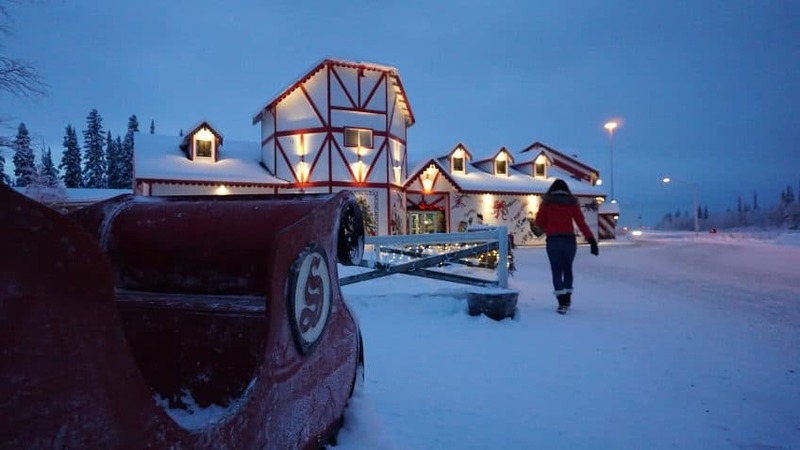 You better believe we spent Christmas day visiting Santa’s home – filled with hot cocoa, reindeer, and ice sculptures. Some of the sculptures and details were super impressive. Fun for a couple of hours. 11. If the roads allow, go snowmobiling! 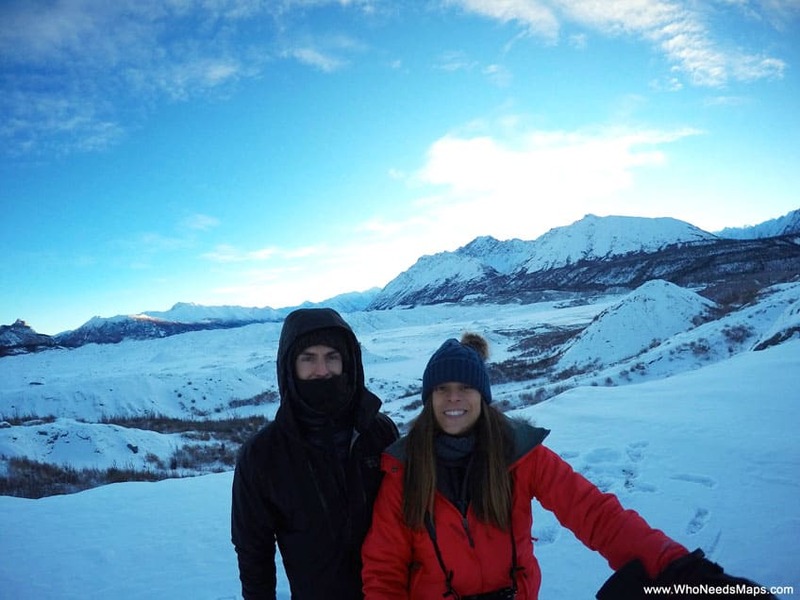 We were most excited to go snowmobiling/snowmachining while we were in Alaska this winter, however, we couldn’t because there wasn’t enough snow! We have heard that this winter was actually a warmer winter… uhh like 5 degrees Fahrenheit. Warm? ha. Anyways, we were told that this is a must do adventure in Alaska. 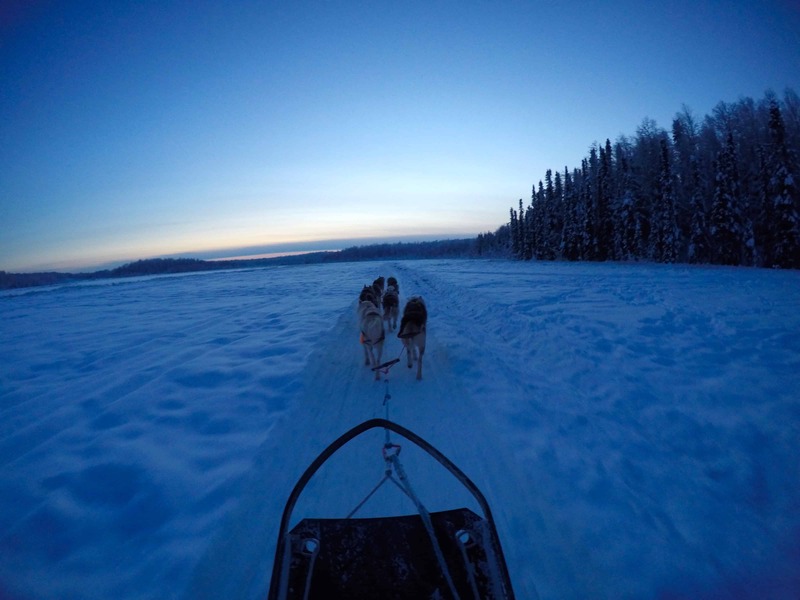 Ride around and see a variety of frozen lakes, creeks, rivers, trees and potentially some wildlife! Have you ever been to Alaska? 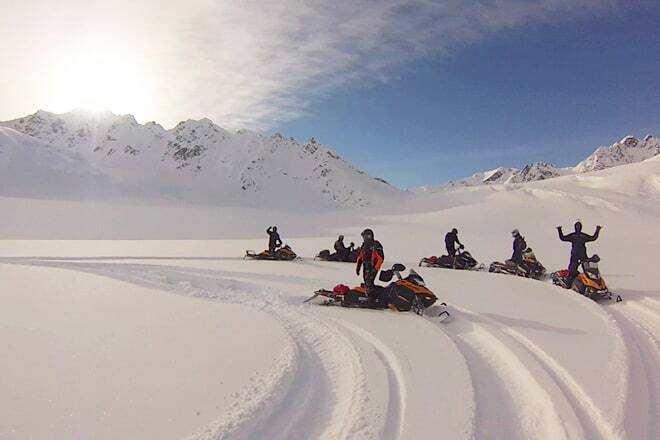 What was your favorite thing to do in Alaska?